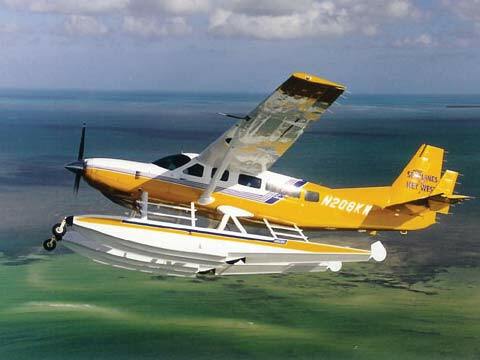 Seaplanes of Key West fly daily to Dry Tortugas National Park and Historic Fort Jefferson A unique seaplane adventure featuring low altitude sightseeing, marine life, snorkeling, history, bird spotting, white beaches and more. Morning, Afternoon and full day tours. Dry Tortugas and Fort Jefferson Dry Tortugas: Many believe the Florida Keys end in Key West. However, this is just the end of US1. The chain of the Florida Keys continues for a further 70 miles west. The very end islands being the Dry Tortugas. The Islands were first discovered by Spaniard Ponce De Leon in 1513. He named them Las Tortugas (The Turtles) due to the abundance of sea turtles. The word â€˜Dryâ€™ was soon added to marinersâ€™ charts to warn of the lack of fresh water. The first construction on Garden Key, in 1825, was a lighthouse to warn sailors of rocky shoals. Fort Jefferson, the largest brick building in the western hemisphere: After the war of 1812 the United Sates of America began construction of a chain of coastal defense forts stretching from Maine to Texas. Construction of Fort Jefferson began in 1846. The United States knew it could control navigation to the Gulf of Mexico and protect Atlantic bound Mississippi River trade by fortifying the Tortugas. Construction continued for over 30 years but the Fort, which covers 11 of the keyâ€™s 16 acres, was never finished. During the Civil War the fort was a military prison for captured deserters. It also held the 4 men convicted of complicity in President Abraham Lincolnâ€™s assassination in 1865, the most famous being Dr. Samuel Mudd. The Fort was plagued with construction problems and Yellow Fever epidemics. The invention of the rifled cannon made the Fort obsolete, as its thick walls could now be penetrated. The Army finally abandoned Fort Jefferson in 1874. In 1908 the area became a wildlife refuge to protect nesting birds from egg collectors. In 1935 Fort Jefferson was proclaimed as a National Monument but it was not until 1992 that Dry Tortugas reached its current status as a National Park. Today the park is staffed by a team of about a dozen park rangers. They live year round in accommodations built into the casemates of the fort. It is an isolated duty and many do not stay more than a couple of years. Their jobs include law enforcement, maintenance and basic support and protection, above and below the water, of the 100 square mile park. There is a self guided tour of the Fort set up by the National Park Service. Tour time is approx. 45 minutes.